Recently I made a trip out to Escondido, which is in East San Diego County to visit the fellas over at the Escondido Tilapia Farm. Out there they have a sustainable set up to raise Tilapia for local fish farmers and urban aquaponic fanatics like myself. 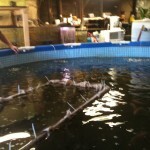 The tiplapia are kept in a 900 square foot barn which is filled with a number of different size pools and breading tanks. All of the fish are separated out by size and date of birth, with the larger fish sharing the big community pools.The water is heated by running a four hundred foot plastic irrigation hose through a huge pile of compost that is nearly two stories high. 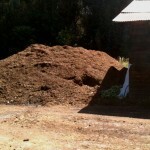 The compost pile generally stays at around 140 degrees Fahrenheit, which heats the water up around 8-9 degrees. The water leaves the tanks at around 71 degrees then re-enters the tanks after traveling through the compost pile at around 80 degrees which is perfect for the fish. 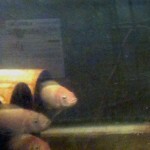 Each day they do a 25% water change to keep the ammonia levels down. They use the dirty water to water their plants in their field, and replace it with fresh well water. They are planning on setting up a full greenhouse to start incorporating an ebb and flow aquaponics system to clean their water in the future. 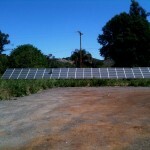 Everything is ran off of solar panels making their operation nearly completely sustainable and almost entirely off of the grid. Inside the barn they had a number of different breading communities set up. These were the typical communities that many breeders tend to use. 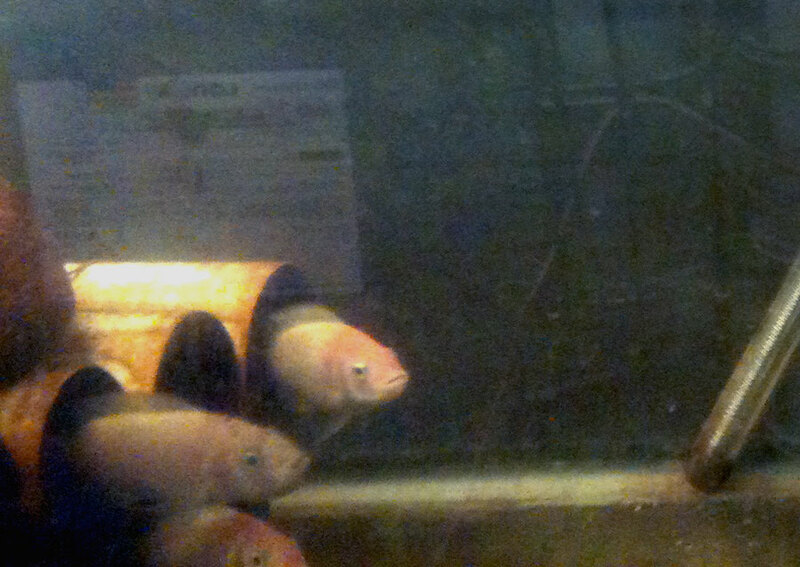 Tilapia will breed on their own, if the conditions are right. 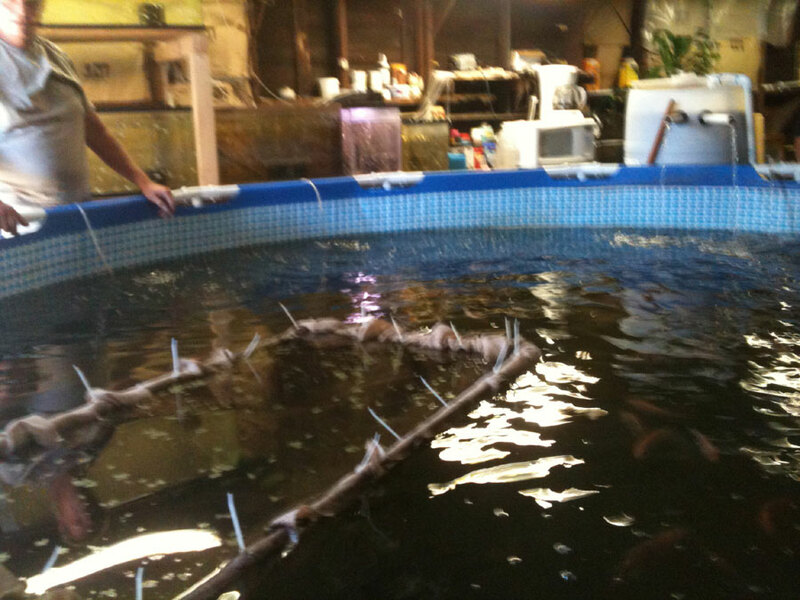 However is you want to be able to track the birth and start breeding your hybrid versions you need to set up a breading tank. 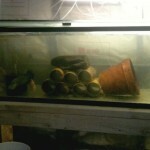 To do this they separated 5 or 6 female fish that are ready for breading with one male fish. All of them are put into a minimum 55 gallon tank. 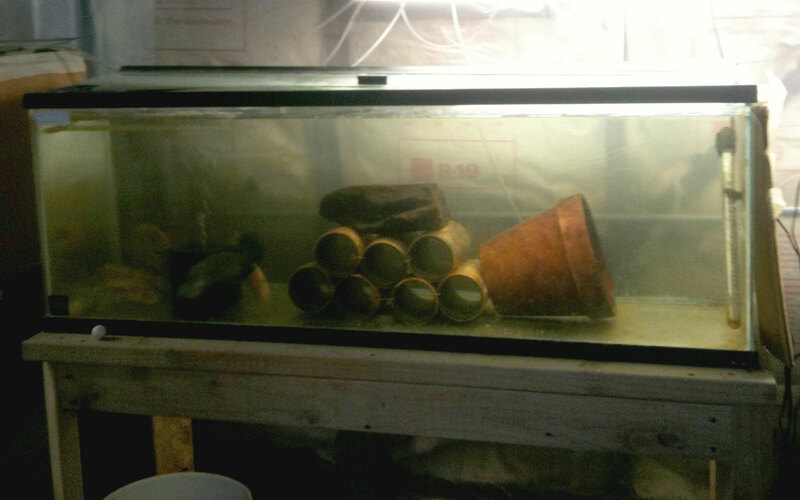 Inside the tank you they added a few 6 inch cuts of 3 inch PVC tubes pluss a flower pot for protection. The female fish like to hide when they are laying their eggs. 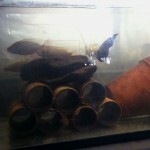 These PVC tubes and flower pot offer the perfect protection needed for the female fish. Tilapia are mouth brooders, meaning that they like to keep their eggs in their mouth until they hatch and become fry. Once the fish become fry and start swimming on they are removed from the tank for protection from their mother and the other fish in the community. I will definitely get some more contact information and directions down the road for those of you interested in visiting the Escondido Tilapia Farm and learning more about raising tilapia. 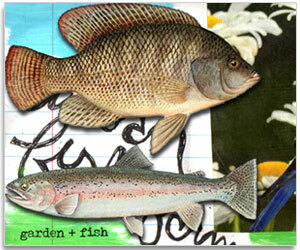 Home Made Aquaponics » « Earthquakes and Survival Kits, Not Scared Just Prepared. Where is this farm, I’m interested in starting one myself and am looking for fry. I wish that I lived near these guys I would pick up around 100 fish to stock one of my tanks. I live in Texas, they frown on most Tilapia out here, total bummer I might add. 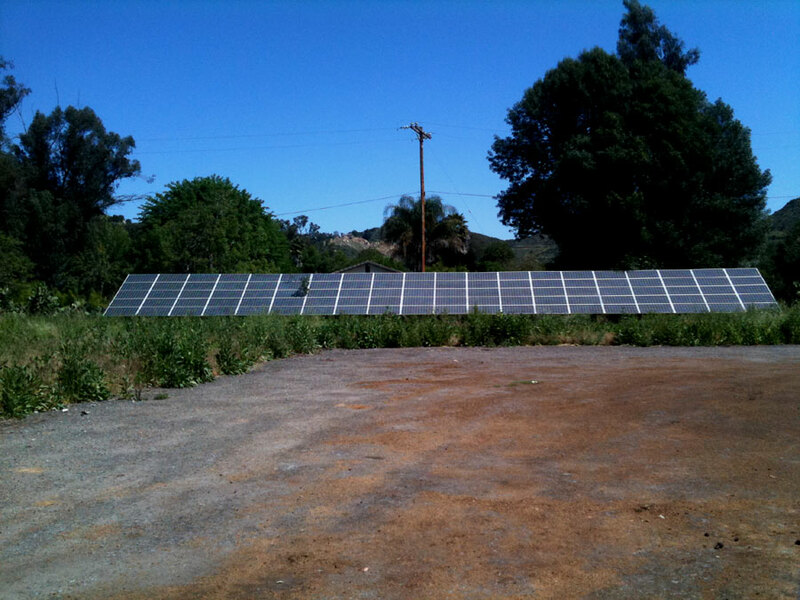 I live in escondido and am researching how to start this and I cant find these guys….. 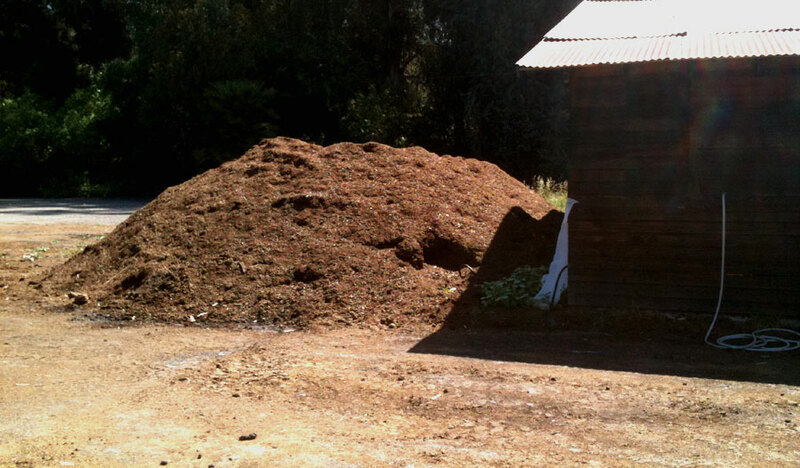 I hear there is a farm in fallbrook which is just north of escondido. I was wondering if this is the place and if not can you provide more information where this is? I wanted to contact them. Can you give me the address I am very interesting in contact them. also interested in the location. I’d luv to get some of those fingerlings for my tank. do you sell live tilapia? and if you do how much is each one? I enjoyed your website immensely! I see where you give the temperature of the water for the fish. Would you please tell me what is the temperature of the water in the growing beds for the lettuce, etc. I am interested in purchasing some live tilapia from you. I will be in San Diego this week///1/28 – 2/2. If you could email me with your address I would like to visit your location and make the purchase. Thank You. I was looking for this place two years ago and never found it. I learned how to breed them. 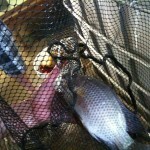 Anybody looking for fry/fingerlings in the escondido area, contact me. I live in Valley Center Ca. I have a mated pair of pet O. mossambicus.. Rupert and Maggie are 9 months old. I have to keep them separated because they love each other to much…(they make to many babies.) . They currently live in a 60 gal tank divided by plexiglass… Would recommend this size tank or larger. They do not like the company of other adult fish ( they take turns beating up on them) Would be willing to part with them for a re homing fee :) . We live in the riverside area.